Dowling was joined by Whitney Metzler, staffer for Rep. Kathy Rapp (R-Crawford/Forest/Warren) chairwoman of House Health Committee; Rep. Aaron Kaufer (R-Luzerne); Joseph Grogan, director of Domestic Policy; Kristina Rasmussen, vice president of Federal Affairs, Foundation for Government Accountability; Robin Walker, director of Federal Affairs, Foundation for Government Accountability; Shannon Alford, government affairs director (state), Foundation for Government Accountability; and Jeremy Baker, senior government affairs associate, Commonwealth Foundation. Dowling has worked with outside stakeholders to include language in the bill creating exceptions that would ensure that the work requirements are applied only to those who are truly able to work. Chris Traylor, acting director, Center for Medicaid and CHIP Services, Centers for Medicare and Medicaid Services. Brian Blase, special assistant to the president for economic policy, National Economic Council. Leslie Ford, special assistant to the president, Domestic Policy Council. Brandon Lipps, administrator, Food and Nutrition Services, and acting deputy undersecretary, Food, Nutrition and Consumer Services, United States Department of Agriculture. The broad topic discussed at these meetings was welfare reform, primarily focused on work requirements for able-bodied individuals, as well as the cliff effect experienced by those working to get off of assistance programs. Last session, Dowling’s House Bill 2138 passed the House 115-80 and the Senate 30-19, but was later vetoed by Gov. Tom Wolf, is slated to be re-introduced this session. 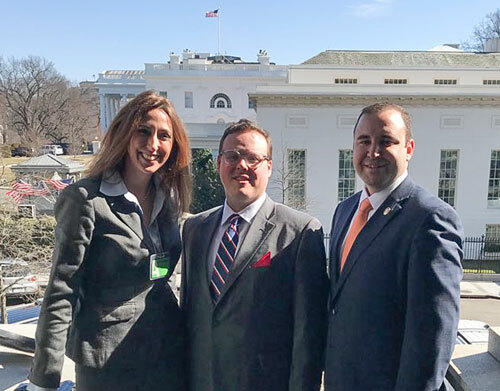 Rep. Matthew Dowling (R-Fayette/Somerset) was joined by serval House colleagues for a meeting with key Trump administration officials to discuss welfare reform. Pictured from left Whitney Metzler, executive director of House Health Committee, Dowling and Rep. Aaron Kaufer (R-Luzerne).